The Jøtul GF 370 DV gas stove utilizes modern design and the new JøtulBurner III to create an exceptional fire view from any angle. Based on the award winning Jøtul F 370 woodstove, the Jøtul GF 370 DV offers the same contemporary cast iron styling in a freestanding direct vent stove. Loaded with standard features including accent lighting, variable speed blower and energy saving ignition system, the Jøtul GF 370 DV is the perfect combination of design and craftmanship. The Jøtul F 370 Concept has received a number of design awards such as the Norwegian “Award for Design Excellence” and the prestigious “red dot award – best of the best“. 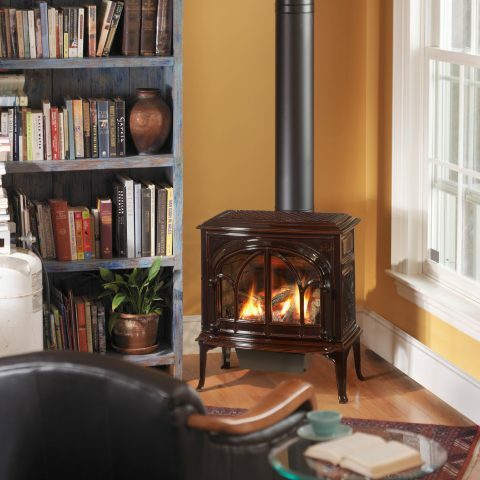 The newly redesigned Jøtul GF 400 DV IPI Allagash gas stove combines a modern inlay cast iron double door design with state of the art combustion technology.